NES Ghosts 'n Goblins (USA) in 13:14.35 by Arc. 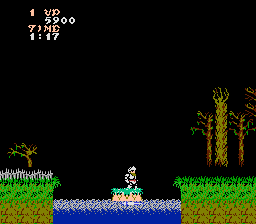 Hello, I tried to do a better run than Morimoto's Ghost's n Goblins after seeing his 2 major mistakes. I was a little bit slower overall as I did some more fighting than him, but at 10:30 into both videos we are at exactly the same point, which is where the cross is located (that he missed). However, there was a glitch on level 6 that caused me to take damage when nothing hit me (due to saving/loading I believe), but I finished out anyway, as it was the only 'mistake.' Anyway, I'll just attach the fmv in case you or Morimoto are interested.